Need to be Prepared in advance, an avi to Kindle fire converter is necessary. If you are a beginner, you may be confused about this, such converter is an app that can help us converting one format to another we need. For kindle fire, we just need converting avi to h,264 mp4, this format is friendly with Kindle Fire and supplies pretty good video viewing experience. Here i use Pavtube video converter to show you how to use such 3rd party tool. Of course, you should download and install this Kindle fire video converter on your computer at first. The process is very simple and won’t take much time. Foxreal studio also make many patches for us to get the presets of latest devices, Kindle fire preset included. Here i suggest you also installing the patch. Now, please follow the tips to do it step by step. 1. Run this conversion software. Add your avi video files. 2. Edit videos to get the effect you want and . 3. Choose Kindle fire formats. Since you have installed the patch, this step is rather simple. Just Click on “Format”, located in “Android” category, then you can easily find the “Amazon Kindle Fire H.264 (*.mp4)”, just select it. Note: By Clicking “Settings”, you will open a “profile settings” window. As follows, you can adjust some parameters to get the video quality you want. But you should know, higher quality with bigger size, Please pay attention to the storage space of your kindle fire. 4. 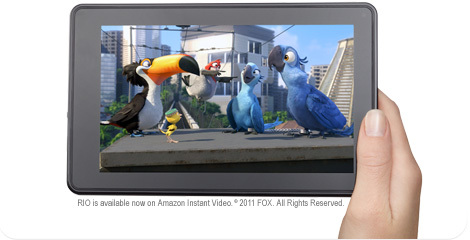 Press the “Convert” button, begin to convert avi videos for Kindle Fire. Thanks to the CUDA technology of this avi converter, the conversion speed is much faster, you will get the result video in a short time. When it’s done, copy the converted video to Kindle Fire. Now, everything is ok. Just enjoy your time! It’s really a cool and helpful piece of information. I’m satisfied that you just shared this helpful information with us. Please stay us informed like this. Thanks for sharing.